MAD Maxine Waters Has ANOTHER Impeachment Meltdown - Most RIDICULOUS Claim Yet! President Trump had his lawyers filed a lawsuit on April 22, seeking to block a subpoena issued by Congress members that sought Trump’s financial information. Congress is once again looking at a bill to require background checks for ammo purchases. Here's everything you need to know. Bruce LeVell, U.S. Small Business Administration Office of Advocacy’s Region 4 advocate sat down with the Daily Caller to talk about what some business owners are saying about Trump's presidency. Levell represents small business owners in Alabama, Florida, Georgia, Ken­tucky, Mississippi, North Carolina, South Carolina and Tenn­essee. Democrats are continuing their efforts to cheat upcoming elections! They are pushing to allow prisoners vote, illegal immigrants to vote, lower the voting age to 16 and subvert the Electoral College. We can't let this happen! 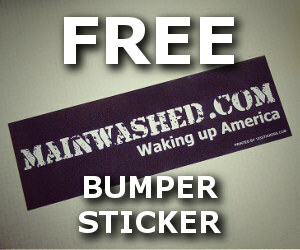 Get your patriotic gear at ==> gear.mainwashed.com!